My Frida Kahlo doll surrounded by “her” nail polishes and lipsticks. Last year, right before Day of the Dead, I was browsing through Instagram when I spotted a photo of Frida Kahlo nail polish and I was intrigued!!! Or maybe I should say, I was obsessed! I had to find this polish and as it turns out, lipstick too!!! You can read about this more in my original post – Frida’s Lipstick and Nail Polish. Last month, I got an email from a young woman interested in finding out more about the Frida nail polish and lipstick. She stumbled upon my blog post and asked to interview me for an online magazine. Again, I was intrigued…!!! We set up a time to talk and I went into my original story and my search for the nail polish and lipstick from this icon in the Hispanic community. As it turns out…the hunt for the nail polish and lipstick is secondary to the reason finding something that “belongs” to Frida is so important. That became the focus of our conversation. Frida has long been an icon of strength, perseverance and independence for many women. So having a nail polish or lipstick with her iconic artwork or her portrait really seemed to be a way to capture this strength, perseverance and independence for ourselves. Having these different Frida inspired nail polishes and lipsticks seems to be a way to be a little bit like “Frida” ourselves. I was becoming fixated again… So after the interview, I began wondering if I could find any more lipsticks and polishes at my local CVS. As luck would have it…I found some that I didn’t already have! So now, I think I have everything that was offered through CVS and that makes me very happy. And…I have the pictures to prove it too! Meanwhile…I’m keeping my eyes open to anything new. Who knows? Maybe there will be a line of eye shadows next?! 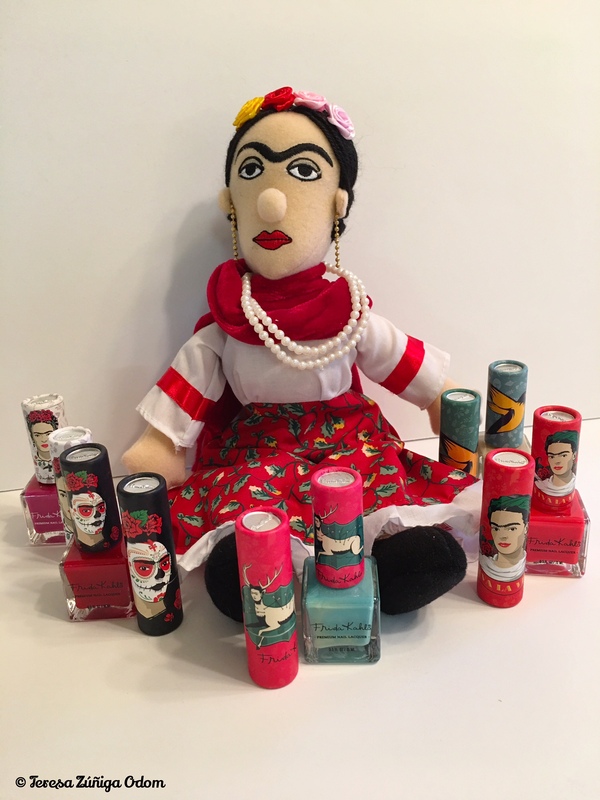 Frida Kahlo lipsticks with my thrift store find – a Frida trinklet box! Love this dark pink color nail polish! A look at all the colors of Frida Kahlo lipsticks and nailpolishes I found at CVS. This entry was posted in Famous People, Frida Kahlo, Mexican Art and tagged CVS, Frida Kahlo lipstick, Frida Kahlo nail polish, Republic on April 10, 2017 by Southern Señora.